Here I share a tiny python script to “patch” a reflective DLL with the bootstrap needed to be executed by the respective stager. Its use is simple, just give it the DLL you want to patch and the preferred exit method (thread by default). I did this because I needed a faster way to patch DLLs instead of letting the msf handler did it for me. This way I don’t even have to call msfconsole. The script looks for the ReflectiveLoader export function, calculate its raw offset and finally make up the stub. 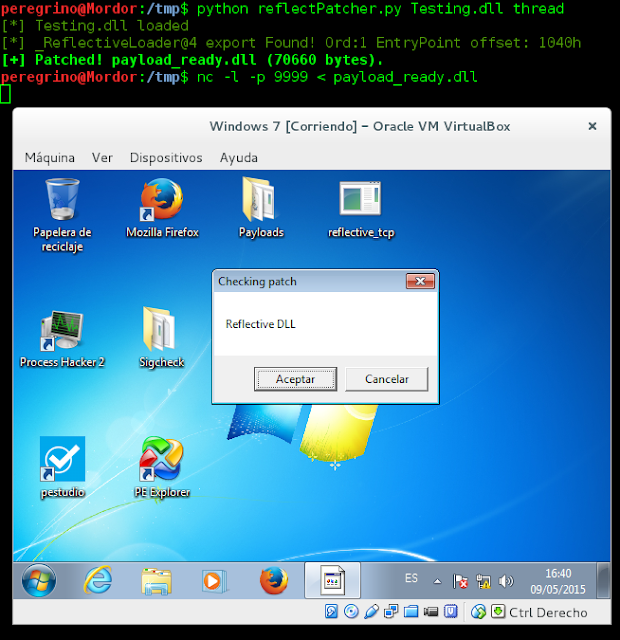 Then, the reflective DLL is build from the stub and the rest of the payload. The script will also add the size of the payload (look at the bytes highlighted in the previous image) at the beginning of the reflective DLL which is necessary for some stagers to know the number of bytes to allocate in the next stage. Generally, a call to VirtualAlloc is done to reserve that memory. Note that those bytes should be removed if you are using a HTTP-based stager. Let’s check it. I have compiled a silly reflective DLL to prompt a messagebox.